Even though the Sapulpa Herald—which has remained Creek County’s primary newspaper for over 100 years—is a direct competitor to Sapulpa Times, I’ve always respected the burden that paper has carried with it as the sole storyteller of our town through the ages. Sadly, the Sapulpa Herald of today is a far cry from the paper it once was, and the Wednesday, April 10th edition proves it, with the seemingly spiteful printing of a photo on the front page. The Creek County Democrats held their biannual convention last Saturday. Among the items they handled on the agenda was the election of new officers. The newly-elected officers are Stan Johnson (Chair), Angie Goodwin (Vice-Chair), and Charles Betzler (Secretary). 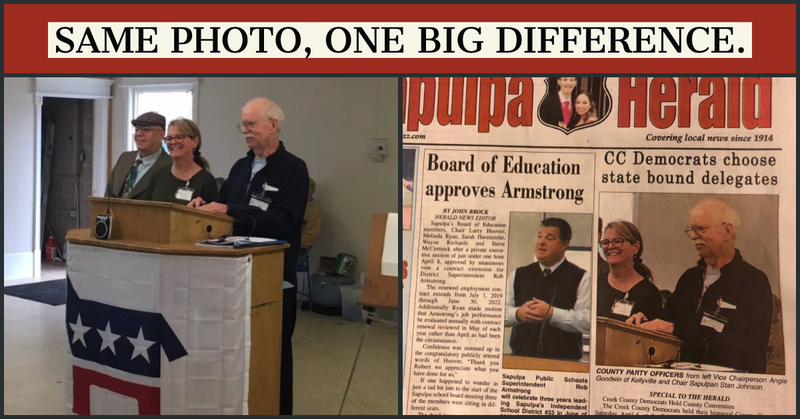 Although all three of the group gathered for a photo behind the podium, only two of the above mentioned participants are shown in the photo or listed in the cutline. Betzler is noticeably absent, having been cropped out of the photo almost entirely. Only his ear and a portion of his cap is visible. If the photo had been a large group or a candid shot, it might be understandable, but this was not a candid photo—it was a posed shot taken just for this occasion, so that all the newly-elected officers could be recognized. Charles Betzler has been an integral part of our team since we began printing a newspaper in September of 2018. His knowledge of our town and love for its history is second to none, and his resourcefulness at meeting the needs we have in getting our stories out is absolutely essential. He has single-handedly created one of our most popular recurring columns, titled “Do You Remember?” and every new story gains heaps of praise and appreciation from a generation that he’s clearly connecting with. Sapulpa Times is extremely fortunate to have him on our team. Each of those in the original photo is active in their community and worked hard enough to be recognized by their peers to the point that they earned a formal position in their committee. Why would the Herald deny any of them that recognition? If you didn’t know the whole story, you might not even notice it, but that’s the Herald’s job—it’s any newspaper’s job—to tell the whole story. If you weren’t already aware, it was Charles Betzler himself who wrote that story on Ed Livermore, Sr.; Betzler’s respect for the man is easy to see and it’s contagious. I was proud to publish the story. I find it disappointing that although we’ll gladly lift up the well-deserved praises of our competitor, the Herald affords us no such luxury. Even more, I find it reprehensible that the Herald would not give an elected officer the recognition he deserves. Mr. Betzler, you have well-earned this position, and the respect of the people who know you. Congratulations, sir. And congratulations as well to Stan Johnson and Angie Goodwin. You all deserve it. Micah, I love your paper. It makes my day to see your paper on Saturday. That was very unprofessional of the Herald to cut Mr. Betzler out of photo. My husband and I enjoy reading about business and locations from years ago. The Herald started deteriorating a couple of years ago. The service was horrible. I spent a lot of time going by to pick up papers which were never delivered. Also the paper got smaller and smaller. Then they stopped delivering and only mailing the papers to us, which was a day late. I am much happier with your paper and it’s articles. Keep up the integrity you have always shown. Thanks so much, Vicky. We’re proud to serve you.